It’s that time of year – when the temperature drops, when the Christmas music plays on the radio, and my alma mater, Hamilton College, contacts me for financial donations. I’m used to this by now. Hamilton never contacts me to ask about how I’m doing, they never contact me to say they liked one of my photos, they never contact me to check on my health, none of that. But when it comes time to finish one of their annual fundraising campaigns, they blow up my cell phone like it’s a condemned building. In the past, Hamilton has recruited their students to contact alumni and ask them for money. And in the past – You know, the old, “Hi, I’m a starving student at Hamilton College, please give us money so I can finish my dream and get a college education” pitch. And in the past, I’ve challenged these students – a few years ago, for example, one such coed called me and asked if I would donate. I asked her about an on-campus occurrence at the college, and she started hemming and hawing and stuttering through her answer – not the greatest presentation for a student at a college that espouses analytical thought and public speaking. I donated anyway. Last year, I received a fundraiser letter from one of my classmates – a fundraiser letter that started with “Dear Charles…” – a sure sign that it wasn’t the classmate – who I had known for years and who was one of my Facebook friends and who damn well knew me as Chuck – didn’t write the letter, and in fact it was the College that wrote the letter as a mass mailing. Ticked me off. I donated anyway, but the donation was not as large as before. In other words, if you want my money, Hamilton College, at least treat me as if I was one of your alumni and not as a glorified ATM machine. And don’t feed me the suspension of disbelief that I’m actually talking to a student instead of a telemarketer. That’s no better than the pop-up ad that promises fifteen different superfoods to help you lose so much weight, you could go to a Halloween party disguised as the number 1. Last Tuesday night, I received a text message on my phone. If you know anything about me from reading this blog, you know I hate spammers and robocalls and scambots. I hate them with a passion. I hate that they take over my cell phone. And for all I know, “Kelsey” might have been someone from a marketing service in Utica or something. Plus, Hamilton is very selective in how they treat their alumni. We all get these alphanumeric alumni abbreviations after our names – H ’85 P ’15 means you were a graduate of the Class of 1985 and you’re a parent of a member of the Class of 2015. I have a good friend who refuses to send them a single donation penny until they actually acknowledge that student’s father was both a professor at the College (back in the 1980’s) and a parent of a graduate. Yeah, I see the issue there. All right, “Kelsey from Hamilton,” if you really ARE a junior at Hamilton, let’s see how well you do with pop quizzes. Now I’m expecting that a spambot would regurgitate whatever “answer” they were expecting, like assuming I had said “yes” or “no” to the previous question. Or they would have taken two or three hours to look up the information. See, I remember from an alumni newsletter that the performer at last year’s Class and Charter Day was this pop singer. And if Kelsey was a junior, then she would have been at Class and Charter Day as a sophomore when Charli XCX was on stage. But let’s confirm that she knows about Hamilton directly. A true Hamilton student knows where the best dormitories are on campus (North, Kirkland, South) and which ones to avoid (Major, Minor, McIntosh). Time for test question number two. 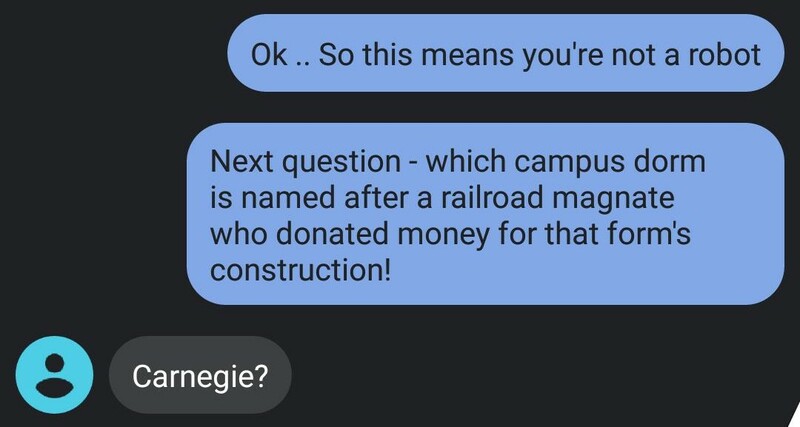 To know this answer means you not only know the dormitories, but you know which railroad magnate donated money so that a dorm was named after him. Dang. Got it right. Andrew Carnegie donated a ton of money to the college way back in the 1900’s and Carnegie Dormitory – which today is, as far as I know, the only dorm on campus where each suite has its own enclosed bathrooms and not shared communal baths and showers along the hallway – was built. See, if Kelsey wasn’t really from Hamilton, I would have thought she might have guessed Rockefeller or Guggenheim or Astor or some other titan of industry. Okay, now for the big test. Do I throw some totally obscure Ham Tech reference at her – something about in what sport did Hamilton win its only NCAA championship trophy (women’s lacrosse in 2007), or do I ask about what was the only co-ed fraternity on campus before the campus eliminated all Greek housing (Emerson Literary Society), or what year did Lin-Manuel Miranda graduate from our fair college (he didn’t, but that’s another Hamilton reference for another time). Nah, I’ll throw Kelsey a softball. 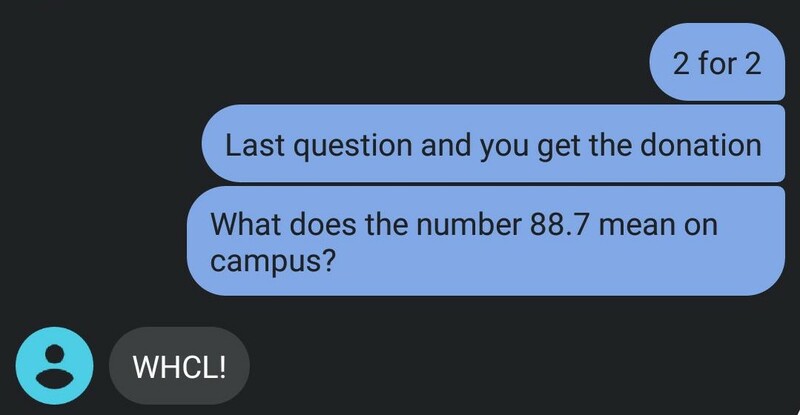 Only a true Hamilton student would get this correct in an instant. See, here’s the thing. As I said before, you’re not going to get any money out of me unless you at least acknowledge some sort of worthwhile communication. And yes, I would love to have millions of dollars that I could donate to the college in exchange for Hamilton naming dormitories after me … I really would. And I am grateful to Hamilton for everything they did to help me get away from my toxic home life and achieve true personal freedom. But when you only hear from the college once every December, and that’s invariably to ask for money … it makes you feel cheap. Both figuratively and literally. So was it necessary for me to put Kelsey through a couple of tests to prove she was a Hamilton student and not just a telemarketer pretending to be a Hamilton student? Yeah. Trust me, Kelsey wouldn’t know me if my name was Chuck XCX. She wouldn’t know that I spent my summer of pre-freshman year at Carnegie dormitory. And she wouldn’t know that I lived at radio station WHCL. Seriously, I lived there. So I let Kelsey stew for a few moments. I knew that her goal was to send me a donation link to pay by phone. Nah. I went to the hamilton.edu website and donated some money. Okay, I’ve let Kelsey from Hamilton stew long enough. And most likely that’s the last I’ll ever hear from Kelsey at Hamilton. That’s fine, I don’t expect us to be pen pals or anything like that. But what I just want Hamilton College to understand is … as grateful as I am for the education I received from your institution, I’d just like – once in a while, not often but at least sometimes – to just have someone call and ask how things are going, what I’d like to see with the campus, maybe talk about some upcoming events on the Hill … and NOT ask for a donation right off the bat. At least make me feel like you actually want me. And not that you just want my wallet. You’ll make a superb retiree. I would love to hire you to answer my phone to take care of the telemarketers, scammers and Omaha Steaks!! !